With a new baby, a new bikini body, a drug addiction, two paternity scandals, and two divorces, the Kardashians had a great 12 months worth of gossip. But how did they hold up against all of Jennifer Aniston's imaginary pregnancies? Or the royal baby? Who won the tabloids this year? Before getting into who landed the most tabloid covers, let's take a moment to reflect on the above graphic. "[Fill in the blank] and Alone" was perhaps the most popular trope this year. There's something about women being "alone" that makes them equal parts pitiable, terrible, and admirable. We should feel bad for them. But they must be the worst to chase people away like that! However, they are so strong to take on whatever task. So compelling. "Monster Moms" was another biggie. In fact, motherhood—or rather, judging mothers and their choices—was something that spoke to us this year (from supermarket checkout aisles). OK! wins the award for laziest cover writing. Honorable mentions go out to "private hell," "train wrecks," and questionable paternity. So, given the material covered in tabloids, perhaps it's unsurprising that the Kardashian/Jenner clan—who managed to hit on every discussion point listed—ruled the tabloids this year. In fact, there were only two weeks in the entire year that were Kardashian-cover-free. Interestingly, it's a strategy that's not working out for the tabloids. Newsstand sales have sunk this year, and publishers are blaming it on "Kardashian fatigue." Issues of Star and Us—featuring the Jenner divorce and exclusive photos of Kim's post-baby bikini body, respectively—under performed. Sources say Jann Wenner paid $110,000 for a heavily retouched photo of Kim Kardashian in a white bikini, which he splashed on the Dec. 23 cover of Us Weekly under the headline, "My Body Is Back." But the glossy, which usually sells about a half million a week, sold fewer than 400,000 copies, an insider with access to circulation reports told me. Bauer's In Touch dropped 70,000 copies from its average circulation with a recent Kardashian cover, and another Bauer title, Life & Style, dropped 50,000. Star magazine, from American Media Inc., sold 50,000 copies less than its newsstand draw of 325,000 with its Dec. 2 issue blaring, "Kris & Bruce: Divorce Bombshell: Kim Helps Kris Hide $25 million." Individually, the top four Kardashians (Kim, Kourtney, Khloe, and Kris) each beat out every other celebrity for number of tabloid covers. Kim Kardashian led the pack the pack with 61 covers. Her sister Khloe came in second with 38, momager Kris Jenner in third with 22, and Kourtney in fourth with 18. Kate Middleton and Jennifer Aniston tied for fifth with 17 covers. 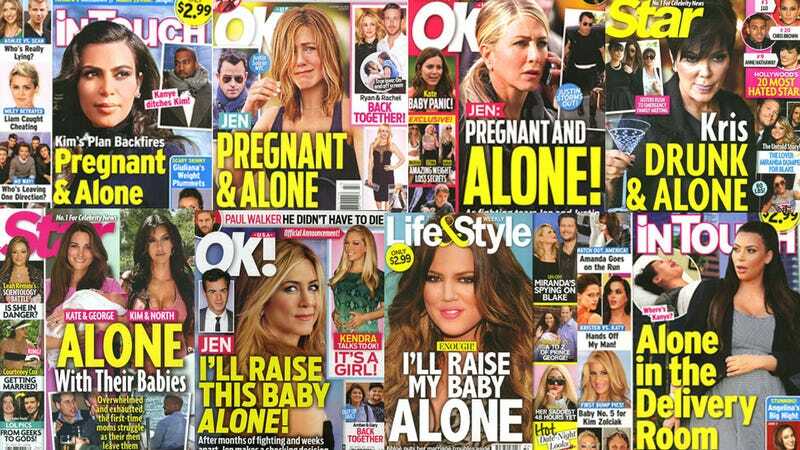 It would seem that Aniston can still sell tabloids, if not movie tickets. The cast of the Bachelor and Bachelorette had 13 covers, Miranda Lambert had 10, and Angelina Jolie had 9. Interestingly, neither Britney Spears nor Lindsay Lohan, both former tabloid queens, were featured on any tabloid covers in 2013. Tabloid cover subjects were almost exclusively female this year. For the most part, the only men to land covers were romantically linked to a Kardashian or dead. That means something, right? Anyway, below is the list of all the celebrities and the number of times they were featured on tabloid covers in 2013.